For those of us that work on the go, a Bluetooth compatible keyboard is often a lifesaver. Most are compact, lightweight, and easily transported. Multi-taskers will especially find Bluetooth keyboards useful. Several include the option to quickly switch between devices. You can answer an email on your iPhone and easily switch back to working on your computer or tablet. It can get frustrating trying to choose the best option to fit your needs. We’ve put together this buying guide with features to look for along with our top picks in different categories. We hope this helps in your search for the perfect Bluetooth keyboard. As you may already know, keyboards can vary greatly when comparing features. Adding the Bluetooth capability is a fairly new concept and allows writers, gamers, programmers, and more to utilize their computer, smartphone, or tablet without worrying with connecting a wire. The range can vary from 10 feet up to 30-35 feet. When you consider today’s fast pace and technology, it’s easy to see how a Bluetooth keyboard can be beneficial. Programmers who switch from device to device throughout their work day can easily stay in one place and use one keyboard. Casual gamers and television buffs can sit back and work controls without worrying about wires or whether or not they will reach. Basically, anyone who loves to use multiple devices simultaneously will find it’s much simpler with a Bluetooth keyboard. The keyboard you choose depends on the amount you want to spend, your must-have features, and compatibility features just to name a few. Our best advice is to consider how you will most likely be using the keyboard. Will you switch it between devices often? 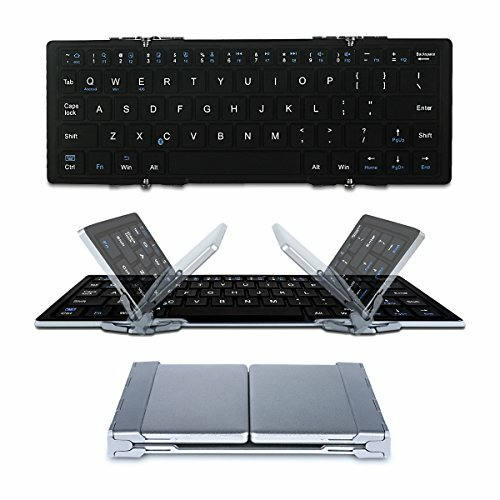 Would you like for your new keyboard to simultaneously switch between 3 or 4 connected devices at once? These are questions you should ask before buying. We’ve also listed a few extra things you may want to consider. 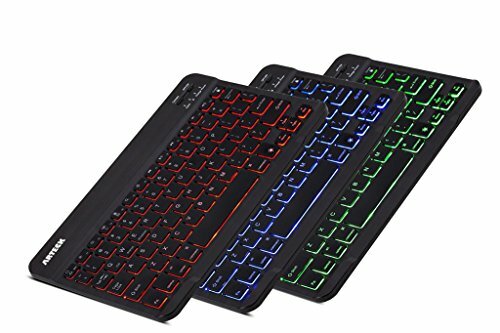 This universal keyboard incorporates Logitech’s Easy-Switch technology allowing users to connect 3 devices at once and easily switch between them with the push of a button. It automatically recognizes each device and maps out the keys to allow you to use the layout you are used to while also including shortcut keys. This compact lightweight keyboard has a 2-year battery life with up to 2 million keystrokes. Available in blue, berry, dark grey, or orange, it is extremely affordable and an excellent choice. 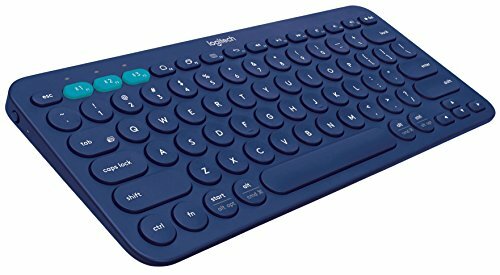 The Logitech K380 is compatible with the following devices: Apple iPad or iPhone iOS 5 or later, Android tablet or smartphone 3.2 or later, Mac OS10 or later, Chrome OS, and the Apple TV 2nd or 3rd generation. 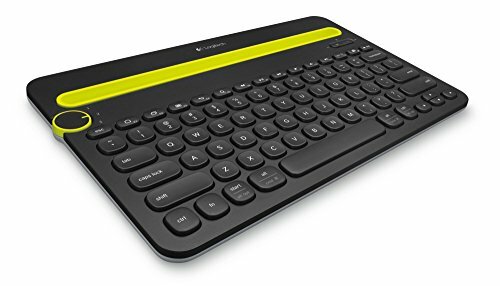 iClever has a great portable Bluetooth keyboard that was named the Editor’s Choice Awards TOP Amazon Best Seller for Keyboards. It has an ultraslim design and is tri-folding making it small enough to put in your pocket. The built-in Bluetooth Broadcam Bluetooth Module allows a range of 10 meters. It’s made of aircraft-grade aluminum with alloy texture giving it a great feel. Auto power off and sleep mode are incorporated to save battery life. It has a built-in rechargeable lithium battery. This affordable quiet keyboard also comes with a 30-day money back guarantee, 12-month replacement, and lifetime support. The iClever Bluetooth keyboard is iOS, Windows, and Android compatible. Lower cost doesn’t always mean low on features as the Anker Bluetooth keyboard proves. The lightweight compact design features comfortable keys and a power-saving mode automatically makes it go inactive after 30 minutes of no activity. This allows the battery to last longer, and the press of any key wakes it right up. It has shortcut keys for multiple tasks and media control keys. The battery lasts over 3 months based on 2 hours of use per day. It has shortcut keys for all 4 systems including iOS, Galaxy, Android, and Windows. It’s a great keyboard for taking anywhere and is backed by an 18-month warranty. It’s not often you can find a Bluetooth keyboard with backlighting that is this affordable. The Arteck keyboard features 7 colors for backlighting including deep blue, soft blue, bright green, soft green, red, purple, and cyan. The LED backlighting also features 2 brightness levels. It is compatible with all 4 major operating systems including iOS, Android, Mac OS, and Windows. This thin and light keyboard features system-specific function keys along with Windows hot keys. It has a 6-month battery life based on 2 hours per day use with no backlighting. It includes a rechargeable lithium battery, USB cable, and a 24-month warranty. Logitech makes a strong appearance on our list due to their vast array of choices in keyboard functions. Their Bluetooth keyboards are no exception. 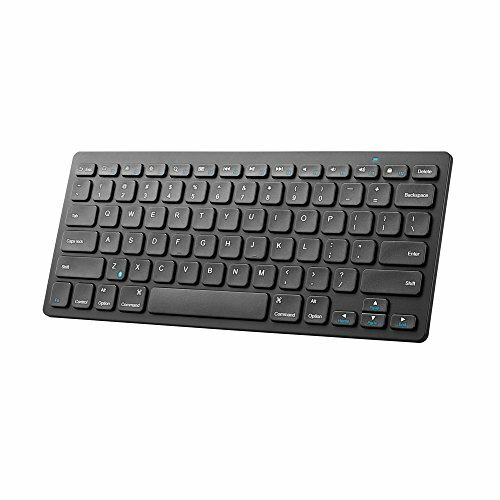 This universal keyboard features Logitech’s Easy-Switch technology allowing users to switch easily between devices with the turn of a dial. It allows simultaneous connections for up to 3 devices. The integrated cradles hold your phone or tablet at a perfect angle. System requirements include Windows 7, 8, 10; Mac OS X or later; Chrome OS; iOS 5 or later; and Android smartphones or tablets 3.2 or later. It comes with a limited 1-year hardware warranty and includes shortcut keys for Windows and Mac. 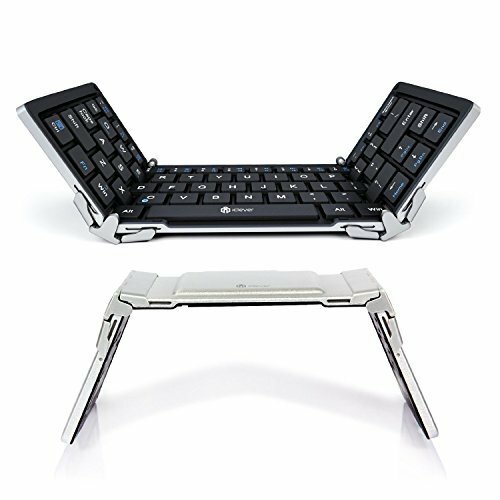 EC Technology has a foldable, aircraft-grade aluminum keyboard that is ultraslim and lightweight. It is compatible with 3 major operations systems including iOS, Android, and Windows. It is easily paired with your devices allowing you to gain quick access to common function keys. The power-saving mode allows it to shut off after 10 minutes of inactivity. It includes a Li-polymer battery that lasts up to 60 hours on a single charge and a USB cable. The Logitech K810 features the Easy-Switch technology allowing users to easily switch between devices with the touch of a button. It has bright backlit keys with automatic illumination that adjusts to the level of light in the room. Proximity detection detects your hands approaching and immediately turns the illumination on. The K810 is compact, ultra thin, and has Logitech’s keycap design ensuring quiet use. It has a battery life of 10 days up to a year depending on the amount of use and illumination.System requirements include Windows 7, 8, 8RT desktop, laptop, Ultrabook, tablet, or smartphone. Apple iPad and iPhone with iOS 4.0 or later and Android tablet or smartphone with 3.0 or later can also be used. The Logitech K811 is much like the keyboard above except it is designed to be used mainly with Mac. The Easy-Switch technology makes it simple to change devices with the push of a button. Bright backlit keys have automatically adjustable illumination. Compact and slim, the K811 has your favorite Mac keys including command and brightness. The Logitech key cap design ensures quiet typing, and the concave full-size keys make it more comfortable to use. With menu, arrow, and playback keys, you can easily control your Apple TV. It requires Mac OS X 10.6.8 or later, iPad or iPhone with iOS 4.0 or later, or Apple TV software 5.2 or later. Finding a good mechanical keyboard that is Bluetooth capable can be challenging. The Drevo Calibur includes all the bells and whistles a great gaming keyboard should have. 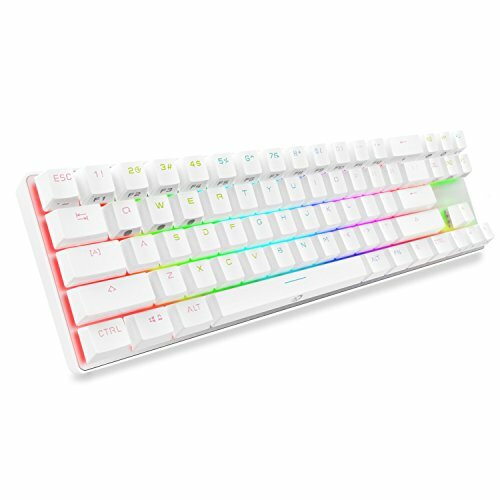 With RGB LED backlit blue switch keys, customizable lights, and true NKRO which prevents ghosting, gamers will love it. 7 different lighting effects include reactive mode, wave mode, ripple mode, and aurora mode. It has a key press life of 50 million keystrokes and a battery life up to 20 hours. It also includes an easy plug and play USB connector. Perhaps a little out of place, but absolutely worth listing, the Querkywriter keyboard is an excellent durable choice for those looking for something out of the ordinary and fun to use. It has an aluminum body construction and the clicky mechanical switches just like the typewriters we used years ago. It has a built-in tablet stand and chromed round keycaps with mechanical switches and tactile feedback. The all metal return bar is macro programmable. It includes a rechargeable battery and is compatible with iPhone, iPad, IMac, Mac Pro, Android tablets, and Windows. If you have the extra money to spend on a keyboard, the Qwerkywriter will not disappoint in ease of use and feature availability.